Nep-Enut's Domain is a level in Super Mario World 2: Yoshi's Island and Yoshi's Island: Super Mario Advance 3. Light Blue Yoshi starts the level on a grassy platform with Grinders and vines. After passing an area filled with Grinders and Nep-Enuts, he reaches some more vines along with more of the aforementioned enemies. Soon after, the Yoshi reaches the Middle Ring and traverses to the next area which begins with some Huffin Puffins followed by a hill with Grinders. The player will need to transform into the Helicopter and find the Yoshi Block in order to enter a nearby door. A Middle Ring and a Submarine power-up are found nearby, the latter needed to pass a water segment filled with enemies. Another door leads to an enemy infested area with a Middle Ring. 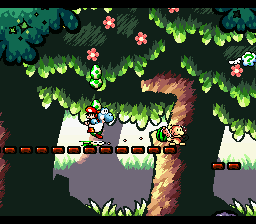 After bypassing some more enemies and obstacles, Yoshi reaches the goal roulette. This page was last edited on April 9, 2019, at 02:33.